Young trainer Jerome Reynier rejoiced in his second Group 2 winner when French raider Marianafoot put his turn of foot to good use to make the Irish Thoroughbred Marketing Cup (Group 2) his own, edging out local hopes on the second day of the His Highness The Amir Sword Racing Festival at the Qatar Racing and Equestrian Club’s (QREC) Al Rayyan Park yesterday. A listed winner from Deauville, Marianafoot stayed midfield for the bulk of the mile-long USD200,000 feature, even as Hadi Nasser al-Ramzani-saddled Top Face set the pace up front under Tomas Lukasek. As the field turned, Pierre Charles Boudot had Marianafoot move up steadily on the outside and, along with Harry Bentley-helmed Black Granite, challenged the leader. In the final few metres, the two challengers turned it into a brief duel, one that was won by Marianafoot by a nose at the post, while Top Face completed the top three. “We knew it was going to be a pacy race, and so the plan was to use his turn of foot. And it has worked well. We were lucky to get the room and it was a brilliant ride from Pierre-Charles. 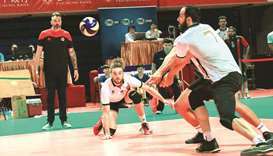 We are just very happy,” Reynier said after the win. Another Frenchman, Alban de Mieulle, completed a hat-trick with two of his local-bred wards picking up fine wins, including the USD100,000 Gulf Cup, yesterday, and Bin General shedding his maiden status earlier in the day. Full brothers Aahil and Barra, from Munjiz out of Daniah, won two straight races on the day – Gulf Cup and Purebred Arabian Sprint Cup – respectively. 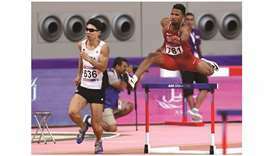 Umm Qarn’s Aahil, under Ronan Thomas, held off a troika of Jassim Mohamed Ghazali wards, beating Molheb Al Naif at the post by a nose in the penultimate race. 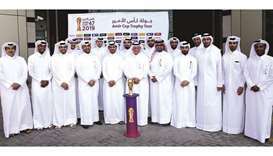 Thomas also helmed Barra to lead a one-two for the trainer with Al Shaqab Racing’s Daloob, helmed by Qatari rider Faleh Bughanaim, in the six-furlong sprint. “I am very pleased for (His Highness) Sheikh Abdullah (bin Khalifa al-Thani) given the horses we breed. Of course, tomorrow will be another day, it will be a big challenge but to win this race was very important for the breeding operation,” De Mieulle told Gulf Times. Before he missed out a couple of times later in the card, champion trainer Ghazali had already notched a hat-trick, taking his total wins from the weekend to 5. First up yesterday was Khalifa bin Sheail al-Kuwari’s Indian Horseman that topped the six-furlong Thoroughbred Plate event for three-year-olds under champion jockey Harry Bentley. The Ghazali-Bentley team had two more winners – Injaaz Stud’s Wayside Flower in the Class 2 Thoroughbreds event and al-Kuwari’s Mosayter in the Local Thoroughbred Trophy. Wayside Flower led a Ghazali sweep of the top three spots, with Festive finishing third, and with Ghazali junior, Mohamed, saddling the runner-up Mualah. Earlier in the day, Qatari jockey Yousef Ali al-Hajri rode a winner when he guided Osama Omer al-Dafea’s Evolution Du Croate to the colt’s first career victory in 12 outings. The other Purebred Arabian to shed his maiden status was Umm Qarn’s Bin General, who showed a glimpse of an exciting future, winning over 2000m on his debut under Ronan Thomas for trainer Alban de Mieulle. 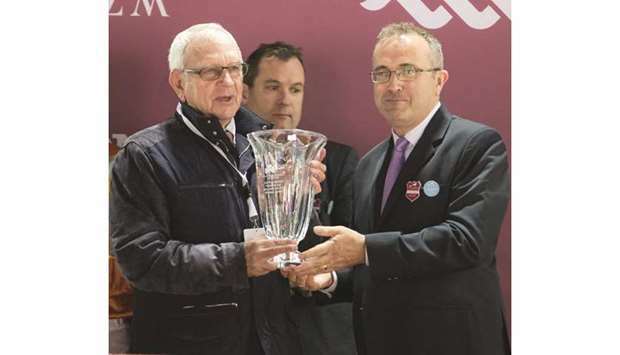 His Highness Sheikh Mohamed bin Khalifa al-Thani’s Al Wannah topped the Local Purebred Arabian Novice Plate event for fillies and mares, as the Julian Smart ward registered her second straight victory. Race 1: 1. Evolution Du Croate (Yousef al-Hajri), 2. Razad (Rashid Ali al-Marri), 3. Ibn Al Ameed (Faleh Bughanaim), 4. Jalal (Meteb Ali al-Marri). Won by: 2 1/2, 3/4, Nk. Time: 2:13.56. Owner: Osama Omer al-Dafea. Trainer: Osama Omer al-Dafea. Race 2: 1. Al Wannah (Ryan Curatolo), 2. AJS Rayah (Tomas Lukasek), 3. Rodina (Harry Bentley), 4. Sarmad (Jean Baptiste Hamel). Won by: 3/4, Hd, 1/2. Time: 1:47.95. Owner: His Highness Sheikh Mohamed bin Khalifa al-Thani. Trainer: Julian Smart. Race 3: 1. Bin General (Ronan Thomas), 2. Taish (Ali Khalid al-Mosallam), 3. Maxr (Theo Bachelot), 4. Mehdi (Damien Morin). Won by: 1, 1/4, 1 1/2. Time: 2:15.00. Owner: Umm Qarn. Trainer: Alban de Mieulle. Race 4: 1. Indian Horseman (Harry Bentley), 2. Life Of Riley (Cristian Demuro), 3. Courageux (Carlo Fiocchi), 4. High Horse (Oisin Murphy). Won by: 1 1/4, 2, 1/2. Time: 1:11.65. Owner: Khalifa bin Sheail al-Kuwari. Trainer: Jassim Mohamed Ghazali. Race 5: 1. Wayside Flower (Harry Bentley), 2. Mualah (JP Guillambert), 3. Festive (Oisin Murphy), 4. Umm Swayya (Gerald Avranche). Won by: ¼, ¾, 1 ¾. Time: 1:37.18. Owner: Injaaz Stud. Trainer: Jassim Mohamed Ghazali. Race 6: 1. Mosayter (Harry Bentley), 2. Saar (Gerald Avranche), 3. Nahaab (Jimmy Quinn), 4. Muraqabah (Theo Bachelot). Won by: 1 ¼, Hd, 2. Time: 1:25.08. Owner: Khalifa bin Sheail al-Kuwari. Trainer: Jassim Mohamed Ghazali. Race 7: 1. Barra (Ronan Thomas), 2. Daloob (Faleh Bughanaim), 3. Melk (Oisin Murphy), 4. Kasser (Stephan Ladjadj). Won by: 1 ¾, Shd, Hd. Time: 1:18.36. Owner: Umm Qarn. Trainer: Alban de Mieulle. Race 8: 1. Aahil (Ronan Thomas), 2. Molheb Al Naif (Harry Bentley), 3. Rassan (Oisin Murphy), 4. Istibdad (Gerald Avranche). Won by: No, ¾, 1 ¼. Time: 1:44.28. Owner: Umm Qarn. Trainer: Alban de Mieulle. Race 9: 1. Marianafoot (Pierre-Charles Boudot), 2. Black Granite (Oisin Murphy), 3. Top Face (Tomas Lukasek), 4. Diplomat (Eddy Hardouin). Won by: ¼, 1, Nk. Time: 1:35.53. Owner: Trainer: Jerome Reynier.